I made an impromptu stop at Cistus Nursery today after staying with some extended family in Oregon. The nursery is located just outside of Portland on Sauvie Island. Being three hours away from my house in Seattle, it's sort of a requirement for me to stop by if I'm ever driving through. Cistus Nursery is a plant geek's nursery. You won't find very many fruit trees or frilly flowers here. Their specialty is in rare evergreen structural plants. 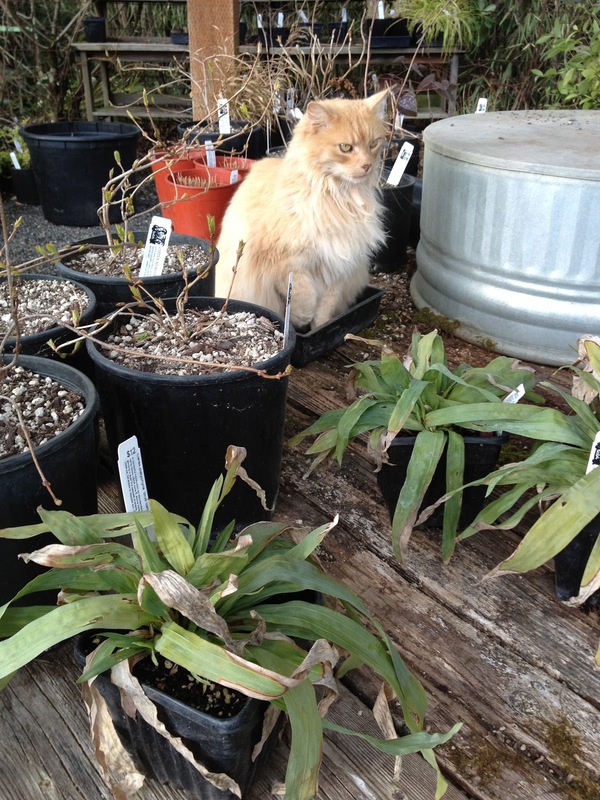 They grow plants like agaves, eucalyptus, palms, bamboo, ferns, cacti, yuccas, and perhaps the Northwest's best selection of hardy broadleaved evergreen trees. In other words, they happen to grow all my most favorite plants. Above, a pair of Yucca rostrata growing in a surprisingly high amount of shade. Below, I'm not quite sure of the plant on the left, but I know the plant on the right: an eryngium agavifolium. Both look a bit miserable but they are also growing in a lot of shade and would probably look better in more sun. At least they're growing in sandy/rocky soil. Here is a nice Trachycarpus Fortunei (Windmill palm). The new information on these is to partially bury the trunk when you plant them, since new roots can emerge from the trunk itself and extend its root system. This palm is really unlike most other palms and thrives in our almost year-round wetness. A look inside the main greenhouse. It is not an exaggeration to say that rare plants outnumber familiar plants. I was checking out the palms when this scrappy old cat started stalking me. Here is an overall view of the nursery looking back toward the entrance. As you can see, I had the place all to myself. Psycho cat stalking me again as I was checking out these sedges. Inside one of the greenhouses. Their heating system does not seem to be very well advanced but I'm sure it does the trick. The check-out area. I have no idea what the plant is on the left. It has the foliage of an echium but is branched like a tree. Leaving Cistus Nursery without any plants is like leaving the beach without a suntan. I quickly realized that a lot of money goes a little ways here. But when you consider the time, effort, and resources it takes to obtain and propagate these incredible plants, it's actually a really good deal. So glad you got to visit Cistus, you made such excellent purchases! The plant on the left in your second to last picture, with foliage like an Echium, is indeed an variegated Echium, beautiful wasn't it?....and in your third photo from the top the plant on the left is an Agave bracteosa. Good to know! Thanks for the insight. Whoa, we just missed each other! Glad you went down. Glad I found this blog. Great to have another young gardener enthusiastic about rare and unusual plants! You and that cat! LOL!! Way to go with Plant Lust. You're doing some nice work there.